While the auto industry is packed full of vehicles that have exterior additions to make them sportier, the new 2013 Honda Accord Sport takes a modest approach to exterior styling while fitting the package with a handful of upgrades that make the Accord Sport more fun to drive – just like a car wearing the “Sport” nomenclature should be. The American auto industry has seen a distinct shift towards sportier exterior design that spans pretty much every segment and while many automakers target performance minded buyers with sport packages that are nothing more than aesthetic – the 2013 Honda Accord Sport offers a handful of features that actually improve the performance of this reasonably priced sedan. The Accord Sport doesn’t really pack any elaborate body dressing to make it look much sportier than the rest of the 2013 Accord lineup but with some subtle cues inside and out combined with improved driving characteristics – the Accord Sport is a car that makes good on the “sport” promise without departing from the efficiency expected of a midsized sedan. For reference, my 2013 Honda Accord Sport test vehicle was fitted with the continuously variable transmission but there were no other options added so it carried a modest price of $24,980 including the destination fee of $780. Those who opt for the manual transmission can expect to pay $800 less but even with the automatic transmission option – the Sport trimline is still one of the least expensive options in the 2013 Accord lineup and that makes the unique features all the more impressive. Readers should keep in mind that the only Accord less expensive than the Sport model is the entry level LX so not only does the Accord Sport pack some driving excitement…it does so without driving up the price. 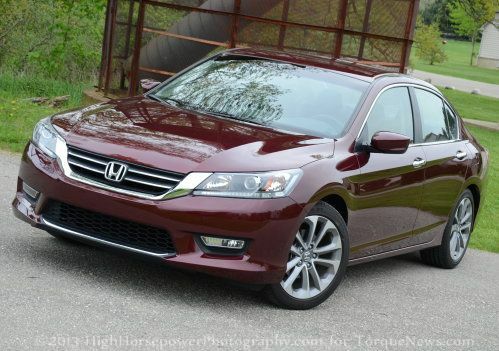 While the unique exterior features of the 2013 Honda Accord Sport are fairly subtle, they are enough to allow this affordable package stand out from the rest of the 2013 Accord lineup. Compared to the entry level Accord LX, the Sport package adds fog lights, 18 inch alloy wheels, a body colored rear spoiler and chrome exhaust tips while the standard design of the modern Accord sedan takes care of the rest. Also, thanks to a smattering of chrome on all sides, the Accord Sport offers a fairly upscale look – especially considering the fact that the Sport is based on the base model Accord LX. Up front, the 2013 Accord Sport has an angry looking front end that is accentuated by the standard projection headlights with accent trim lighting running along the bottom edge of each housing. These headlights provide great lighting for late night driving while also looking very upscale with their overall design. Between them is a large chrome trim piece that wraps the chrome trimmed grille with a final chrome trim piece running along the “chin” of the front fascia. The standard fog lights of the Sport package are set in a matte black housing with more matte mesh filling the large central grille opening that extends down to the bottom of the front fascia. Along the sides, the 2013 Honda Accord Sport is a little bit sporty and a little bit luxury with silver 18 inch wheels, chrome door handles and chrome trim surrounding the side glass. Like so many other sedans on the market, the Accord Sport has a b pillar area finished in black to provide a more fluid, almost coupe-like look from the side and when combined with the higher rear roofline and the sloping rear glass – the side profile of the Accord is sporty regardless of which trimline is chosen. Out back, the Accord Sport features the most noticeable additions with a low profile body colored spoiler and bright polished dual exhaust tips while some standard chrome running between the big, bright taillights and between the dual exhaust tips maintain that higher end feel. Of course, there is also the lone Sport badge that helps to differentiate this model from the rest. It should be noted that for $1,373, Accord Sport buyers can opt for an Aero package that adds a front chin spoiler, deeper side sills and rear rocker extensions to help hammer home the sport theme but in standard form, the Accord Sport has a look that fits the part. While some critics may contest that it doesn’t look sporty enough for their liking, the fact of the matter is that the average buyer wants sporty but not too sporty and the Accord Sport package does a fine job of walking that line and in the long run…those who want a more aggressive design can opt for the aforementioned Aero package. With all due respect to Honda and to the millions of people who have purchased an Accord sedan over the past 20 or so years, this has traditionally been a vehicle with a very bare bones, appliance-like interior but that is not at all the case with the 2013 Honda Accord Sport. In fact, many of the features that help make this interior layout so impressive are standard across the entire model lineup so not only has the Sport package stepped up its game – the entire Accord family has an interior layout that departs greatly from the bare design of the past. Most importantly, Honda has put together this very well equipped interior without sending the price through the roof. While you won’t find an expensive touch screen ,touch sensitive controls or even leather seats in the Accord Sport, buyers are sure to enjoy the surprisingly loaded up standard feature list. This includes things like a large, easy to read infotainment screen mounted high on the dash, dual zone climate control and steering wheel mounted controls for both the stereo and the hands free phone system. Both the stereo and HVAC systems are controlled by easy to use controls mounted on the center stack so those who like simplicity in their interior functions will surely love the Accord Sport controls – no concern about a learning curve here. The design of the center stack with the large touch screen at the top creates a very modern, upscale look but the basic layout of the controls is ideal for those who don’t like having to learn how to turn on their radio or AC. The 2013 Accord Sport sedan comes with standard black cloth seats with white accent stitching with 10 way adjustability for the driver’s seat that allows for a comfortable environment for drivers of a large range of heights. The seat adjusts enough to accommodate a very short driver but the roomy cabin and low seating position allows for plenty of headroom and footwell space for very tall drivers. The driver and front passenger will enjoy a ton of leg and knee room which is pretty much expected at this point but unlike some other models in the class, the rear seats offer similar spacious comforts even when the front seats are moved back to very comfortably seat a pair of 6 foot tall people. In some midsized sedans, moving the front seats back can quickly diminish the rear leg room but the Accord offers tons of space for front and rear riders. In fact, the Accord Sport provides real leg room in the rear seats for adult passengers without having to sit with their legs turned in to the middle. The interior of the 2013 Honda Accord Sport shows how far this top selling midsized sedan has come in the last two decades and while you won’t find leather seats (even as an option), this is a car that provides a ton of space for the driver and all passengers with a stereo and HVAC system that looks upscale but achieves that look without the headaches that come with many modern high tech systems. So many sport models on the market today pack the interior full of high dollar items that have no relation to sporty driving but the Accord keeps things simple (thus keeping the price down) and Honda was able to do this without the interior looking bare or cheap. In the end, the fact that this is basically a standard base level interior with a power driver’s seat and a leather wrapped steering wheel is one of the most impressive aspects of the Accord Sport. The 2013 Honda Accord Sport has been criticized because unlike most performance minded models – it comes with the standard 2.4L 4-cylinder engine rather than the vastly more powerful V6 that comes in the higher end Accord trimlines. This means that you only get 189 horsepower as opposed to 278 from the V6 but the output of the Sport package is 4hp higher than the other 4-cylinder powered 2013 Accord sedans thanks to the a easier breathing exhaust system. This isn’t that much of an increase but every horsepower counts and the real story with the performance of the Accord Sport is in the handling capabilities. Honda has fitted the Accord Sport with a stiffer suspension setup including a more rigid strut tower brace and a power steering system that has been tuned for tighter, more acute response. Combined with the 18” alloy wheels, the suspension system allows the Accord to grip the road a bit better without killing the ride quality. Granted, the Accord Sport doesn’t handle like a supercar but for someone who wants a bit more driving excitement will find that this package yields better road handling skills than the rest of the Accord lineup. In addition to the improved handling, the sport steering setup allows for quicker and more dramatic response to driver input so while I would imagine that very few Accord Sport owners spend much time at the race track – those who do give it a shot will find that this unique steering system provides a much more positive, grounded feel than the steering system of the other 2013 Accord sedans. Best of all, the subtle suspensions adjustments are executed gradually enough that the Accord Sport still offers a nice smooth ride when soaring along the highway with minimal amounts of road vibration transferred through the suspension or steering. I did notice that with a strong cross wind on the highway while traveling at 70-75 miles per hour, you did get some wind noise in the cabin but that was only at higher speeds with very strong winds. Under normal driving conditions – especially at speeds below 65 or so – the cabin was whisper quiet while driving with the windows up. Speaking of driving excitement, the 2013 Honda Accord Sport comes with a standard 6-speed manual transmission but my test vehicle was equipped with a continuously variable transmission feature steering wheel mounted paddle shifters. I am admittedly not a big fan of CVTs but the unit used in the Accord Sport is nice because it allows the driver to control a selection of simulated gears and the ability to bang your own gears – even without the use of a clutch pedal – adds a little extra fun to the drive. During stints of spirited driving on curvy back country roads, the paddle shifters allow you to control your speed as you enter your turns and to put the RPMs right where you want them as you exit the turns. Again, these high performance aspects may not be used frequently but for those drivers who want to really enjoy their Accord Sport…this is another feature that most drivers who love to drive will appreciate. You still have to deal with the crazy revving that comes with all CVT gearboxes but compared to the competition, the Honda CVT is among the better Ive driven. One of the biggest advantages to Honda opting for the 2.4L 4-cylinder engine in the Accord Sport is fuel economy and with figures of 26mpg in the city, 35 on the highway and 29 combined – the Accord Sport is likely one of the most fuel friendly sport packages on the market today. During my time with the Accord, I found that all of those EPA figures were very accurate although driving the car unusually hard will cause the MPGs to drop into the mid 20s over the course of an average tank of fuel. The 2013 Honda Accord Sport has been criticized for not having a dramatic enough exterior or packing tons of horsepower but this really is a great option for someone who wants the efficiency and reliable that the Accord is known for but with a little extra touch of driving flair. The exterior features are subtle in standard form but buyers can opt for the Aero package that makes the Accord Sport vastly sportier and the interior layout shows just how far Honda has come in terms of packing an impressive number of modern amenities into such an affordable, roomy sedan. This isn’t a car that is going to hurt many people’s feelings at the drag strip but for a driver who wants a car that offers a more engaging driving experience without compromising a smooth, high quality ride for daily use – the Accord Sport is a great low cost option that won’t beat you up at the pumps. It is just enough “sport” to satisfy those who want a little more fun out of their midsized sedan but it is subtle enough that it wont turn off prospective buyers who don’t want to drive something that looks too much like it was designed in the aftermarket.